In addition to an eight-race program that includes two turf events, fans and horsemen will also be treated to a brand new Winner's Circle at Golden Gate Fields when the East Bay oval opens its 23-day Summer Meet today. Traditionally, win pictures have simply been taken on the main track just outside the saddling paddock. The all-new Golden Gate Fields Winner's Circle, which includes decorative landscaping and an elevated platform, provides a first class addition that will help Golden Gate to “shine brightly” to both on-track patrons as well as fans wagering in-state and nationwide. Golden Gate, which is offering horsemen a $2,000 purse increase on every claiming race for horses running for a $16,000 tag or less throughout the meet, will also welcome back its 2018 Winter/Spring Meet leading jockey, Abel Cedillo, who figures to be visiting the new Winner's Circle on a regular basis. “I'm happy to be back at Golden Gate and the new Winner's Circle looks fantastic,” said Cedillo. “Golden Gate is home. It's a really nice track and it's fun to ride here. I've been working a lot of horses in the mornings and hopefully, I can get on a lot of live horses in the afternoons. Jonathon Wong, Golden Gate's leading trainer at the 2018 Winter/Spring Meet, is another horseman who's glad to be back home. With the exception of Labor Day, Monday, Sept. 3, Golden Gate will conduct live racing on a Thursday through Sunday basis with first post time each day at 1:45 p.m. PT. The track will once again offer popular 50 cent Pick 5 wagering, with the Early Pick 5 comprising a 14 percent takeout, as well as the $50,000 Late Pick 5 each Sunday, which features a guaranteed pool of $50,000. Golden Gate has also announced that its popular Dollar Day Sundays promotion will return beginning Aug. 26. Dollar Sundays offer fans one dollar General Admission, parking, hot dogs, beers and mimosas (must be 21 years of age). 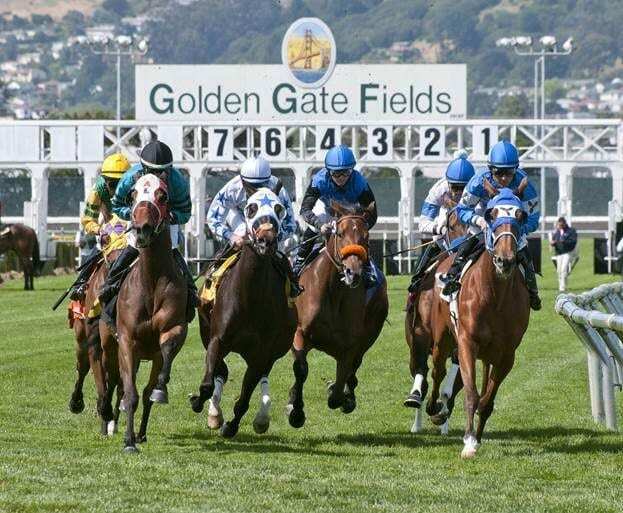 For more information and to purchase tickets for the races and for Golden Gate promotions and events, please visit www.goldengatefields.com or call (510) 559-7300. This entry was posted in The Biz and tagged california horse racing, california racing, Golden Gate, golden gate fields by Press Release. Bookmark the permalink.